The preeminent "guitar hero" to emerge during the 1960s -- as well as being fashioned into the principal deity in the pantheon of celebrity drug casualties -- Johhny Allen Hendricks (soon re-named James Marshall Hendricks and eventually known as Jimi Hendrix) was brought into the world in the city of Seattle, the son of Al Hendricks and his wife Lucille Jeter. Although spending some of his early years living in Vancouver with his grandmother Nora Rose Moore, Jimi was primarily raised by his father following his parent's divorce in 1951, his mother being removed from his life entirely in 1958 as a result of alcohol-induced cirrhosis. Al recognized and encouraged his son's enthusiasm for music, and provided him with first a ukulele and then a cheap guitar in the months following his mother's death; Jimi subsequently immersed himself in learning the instrument, and joined his first band The Velvetones shortly afterwards. By the summer of 1959 Hendrix had bought his first electric guitar and moved from The Velvetones to another local ensemble called The Rocking Kings. Two years later, however, his musical activities were temporarily hindered by a run-in with the law (apparently involving car theft), resulting in 2 years of compulsory service in the Army; a decidedly unenthusiastic soldier, Hendrix completed less than a year of training as a paratrooper at Fort Campbell in Kentucky before breaking his ankle and receiving a discharge. During this period he formed The King Casuals with Army friend Billy Cox, and after leaving the service the pair moved to Nashville, where they became active in the thriving R&B scene centered around the clubs on Jefferson Street. It was here that the guitarist (now using the name Jimmy James) began to establish a reputation for himself, struggling to earn a living as a session and backing musician for acts such as B. B. King, Sam Cooke, Jackie Wilson and Ike and Tina Turner; by 1964 he had relocated to New York and expanded his resumé to include work with King Curtis, The Isley Brothers and Curtis Knight. After working as part of Little Richard's backing band in 1965, Hendrix formed Jimmy James and the Blue Flames, assuming the role of both lead guitarist and singer for the first time. The band's appearances on the Greenwich Village circuit quickly brought its dynamic frontman to the attention of fellow musicians such as Frank Zappa, session player Jeff "Skunk" Baxter and -- most significantly -- former bassist for The Animals Chas Chandler, who would sign Hendrix to his new management and production agency the following year. Chandler then moved the guitarist to London, altering the spelling of his first name to "Jimi" and helping him to organize a backing band: the result being a trio called The Jimi Hendrix Experience, featuring former guitarist for The Loving Kind Noel Redding on bass and jazz drummer Mitch Mitchell. The Experience's impact on the London music scene was immediate and significant, with Hendrix himself earning the admiration of the leading British rock musicians of the time. Making their entrance onto the music charts with the single Hey Joe in December of 1966 and then following with Purple Haze, The Wind Cries Mary and their debut full-length Are You Experienced in 1967, the Jimi Hendrix Experience quickly positioned themselves as one of the leading acts of the late 1960s, the hype generated by the records magnified by Hendrix's stage persona -- which included such visual theatrics as playing his guitar with his teeth or behind his head, and then setting it on fire and destroying his amplifiers at the end of the set. His appearance at the Monterey Pop Festival (instigated by Beatle Paul McCartney) provided an opportunity for this dramatic display to be captured on film, while also spreading the band's popularity back to the States. A second album, Axis: Bold as Love, was released at the end of the year -- not quite a chart-successful as the first, but containing one of Hendrix's most enduring songs Little Wing. In 1968 Hendrix moved his base of operations back to New York, establishing his own studio (named "Electric Lady") in order to fully realize his musical ambitions without outside interference (although it would be two more years before work on the elaborate studio was completed). The ambitious double LP Electric Ladyland was issued later in the year, preceded by a single release of an interpretation of Bob Dylan's All Along the Watchtower. The album was enthusiastically received, becoming Hendrix's first #1 in the U.S.; it would also be the final offering from the Experience, as the guitarist's obsessive perfectionism regarding his music -- combined with increasingly erratic behavior fueled by his drug intake -- had brought an end to his relationship with Redding by the middle of 1969 (manager Chandler having already quit in May of '68). Hendrix assembled the six-piece unit Gypsy Sun and Rainbows immediately afterwards, using them as his backing band for his performance at the Woodstock Festival in August. Not long after Woodstock, Hendrix assembled the trio Band of Gypsys with old Army friend/former King Casuals bandmate Billy Cox and drummer Buddy Miles. This line-up endured only until the end of January 1970, but a self-titled live document culled from two performances on New Year's Day was released later in the year, which would become one of his most popular albums. After the departure of Miles, Mitch Mitchell was subsequently brought back into the fold, with the band once again assuming the name The Jimi Hendrix Experience; recordings for what was intended to be another double LP were undertaken in between an active performance schedule, but the sessions were interrupted by a tour of Europe, launched at the end of August with an appearance at the third Isle of Wight festival. 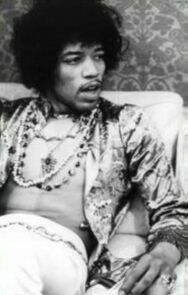 Cox was forced to abandon the tour after only a week for health reasons, after which Hendrix decided to spend a short time in London before returning to New York. On the morning of September 18th he was found dead by girlfriend Monika Dannemann, the guitarist having apparently asphyxiated on his own vomit after taking an excess of sleeping pills. His body was subsequently brought back to the States and buried next to his mother in Renton, Washington. King County Hospital, Seattle, Washington. Charles R. Cross, Room Full of Mirrors: A Biography of Jimi Hendrix (2005). Hendrix was discharged from the US Army in 1962 for "homosexual tendencies" after he told an army psychologist the he had fallen in love with a male soldier.